The International Whaling Commission voted down Friday a Japanese proposal to resume commercial whaling, prompting Japan to hint that it may withdraw from the organization. Tokyo had hoped to resume commercial whaling of relatively abundant species such as minke whales, but antiwhaling countries including Australia and New Zealand opposed the motion. 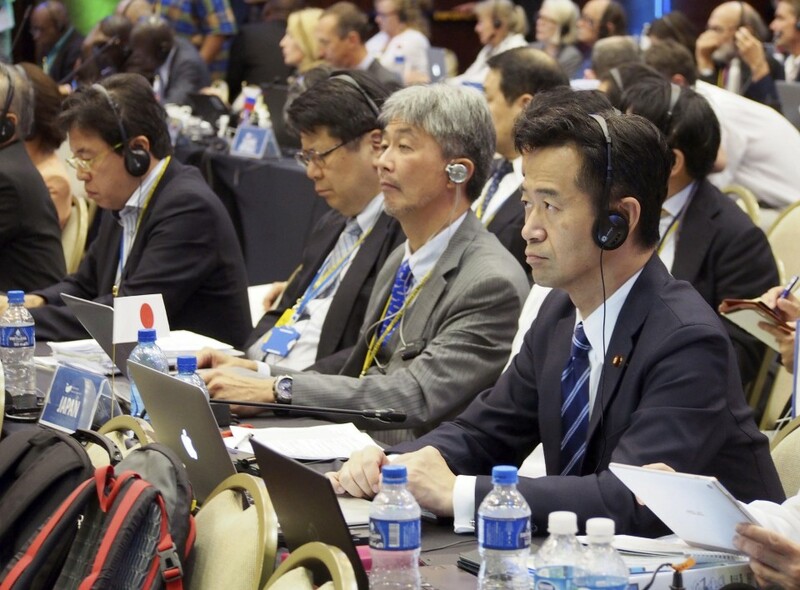 Twenty-seven countries supported Japan's proposal on the final day of the five-day annual meeting in Florianopolis, Brazil, while 41 voted against it. Masaaki Taniai, vice minister for Japan's Ministry of Agriculture, Forestry and Fisheries and head of the Japanese delegation, told the meeting after the vote that Tokyo had no choice but to "examine all possible options." "Now I'm painfully aware that the IWC is not functioning to fulfill its duty," Taniai said at a press conference after the meeting. The Brazilian government, which hosted the meeting, welcomed the international body's decision, saying it will help to save thousands of whales. A pullout by Japan would spark criticism that it is taking international rules lightly, but the Japanese government is facing pressure from local fishermen to restart commercial whaling. "It is regrettable that we always have similar outcomes (at the IWC)," said Teruto Seko, head of the local fisheries cooperative in the town of Taiji, Wakayama Prefecture, known for the hunting of dolphins and small whales. Seko attended the meeting. Taiji Mayor Kazutaka Sangen said, "It's become meaningless to belong to the IWC. Japan should review its financial contribution to the body as well." As a Japanese proposal in 2014 to resume commercial whaling was also rejected, Tokyo called this time for the easing of IWC decision-making rules. It did so in part to make the overall package appealing to antiwhaling members by making it easier to establish whale sanctuaries where whaling is banned. Currently a three-quarter majority of IWC members is needed to set a catch quota or establish a sanctuary. The Japanese proposal would have lowered the hurdle to a simple majority. Japan also suggested in 2007 that it might withdraw from the IWC, in protest at the ban on commercial whaling, but it was later persuaded by the United States and other countries to remain in the organization. Masayuki Komatsu, a senior fellow at the Tokyo Foundation for Policy Research, criticized Japan's approach in pursuing the proposal. "Japan does not have a clear strategy for resuming commercial whaling. The government should take a hard look at itself," Komatsu said.